A 66-year-old man with a past medical history significant for mixed connective tissue disease who initially presented to the emergency department with left lower extremity edema and erythema of one-month duration that worsened over the last day. There was no history of trauma. He was hemodynamically stable with bilateral palpable lower extremity pulses. There was an abdominal bruit and pulsatile abdominal mass on physical examination. He had chronic unilateral sensorineural deafness. Complete blood count, electrolytes, lactic acid and lipid panel were within normal limits. He had a pertinent family history for a mother who died of a ruptured abdominal aortic aneurysm at 70 years old. 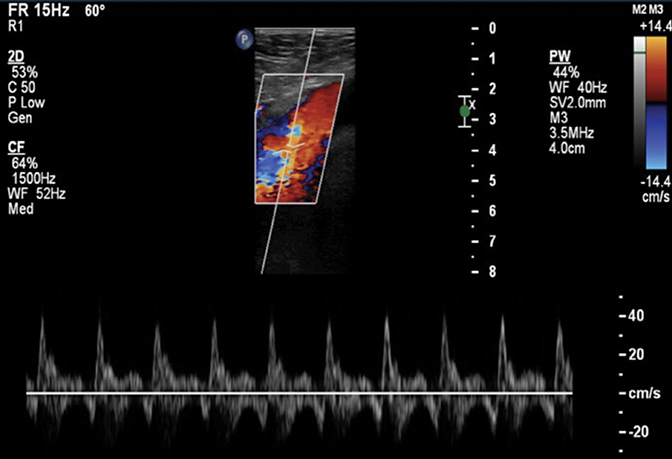 A lower extremity venous Doppler examination demonstrated arterialization of the venous system from a fistulous connection (Figure 1). 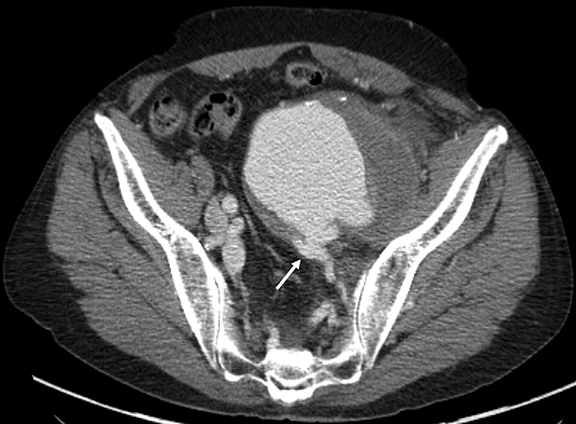 Arterial phase computed tomography showed a large contained rupture of a left common iliac artery aneurysm with fistulous connection to the left common iliac vein (Figure 2). 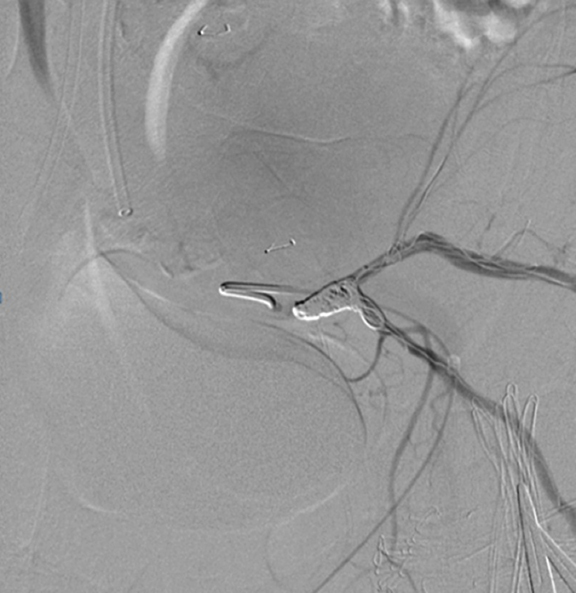 The left internal iliac artery was coil embolized (Figure 3). An endovascular stent was placed from the ostium of the left common iliac artery and required extension to the distal aspect of the left external iliac artery to treat a Type I endoleak. The post-angiogram demonstrated successful stenting of the aneurysm without evidence for endoleak (Figure 4). Isolated Iliac artery aneurysms are rare at < 1%.1 Iliac artery aneurysms are seen in 10-20% of patients xdcki of abdominal aortic aneurysms.2 The risk of rupture increases with aneurysm size and repair is recommended for aneurysms > 3 cm in diameter.3 The presentation can be neurologic, genitourologic or gastrointestinal due to external compression. Abdominal pain is commonly present in symptomatic patients. Isolated iliac artery aneurysms are rare entities that can be treated with an endovascular approach. The risk of rupture increases with aneurysm size and repair is recommended for aneurysms > 3 cm in diameter.3 There is a risk of buttock claudication and impotence with internal iliac artery embolization. Dorigo W, Pulli R, Troisi N et al. The treatment of isolated iliac artery aneurysm in patients with non-aneurysmal aorta. Eur J Vasc Endovasc Surg. 2008;35(5):585-589. Sakamoto I, Sueyoshi E, Hazama S et al. Endovascular treatment of iliac artery aneurysms. Radiographics. 25.Suppl_1 (2005);S213-227. Dix FP, Titi M, Al-Khaffaf H. The isolated internal iliac artery aneurysm--a review. Eur J Vasc Endovasc Surg. 2005;30(2):119-129. Pitoulias GA, Donas KP, Schulte S et al. Isolated iliac artery aneurysms: endovascular versus open elective repair. J Vasc Surg. 2007;46(4):648-654. Boules TN, Selzer F, Stanziale SF et al. Endovascular management of isolated iliac artery aneurysms. J Vasc Surg. 2006;44(1):29-37. Alexander R, Rizer M, Beasley R,. 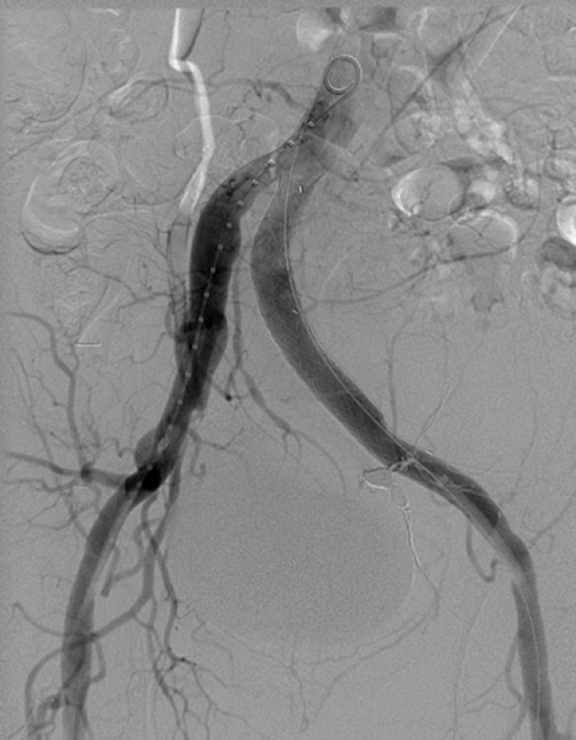 Mixed connective tissue iliac artery aneurysm with arteriovenous fistula. Appl Radiol. 2016;45(5):38-39. Prepared by Dr. Alexander and Dr. Rizer while Radiology Residents in the Department of Diagnostic Radiology, and Dr. Beasley while serving as Chief of Vascular and Interventional Radiology and Director of the Vascular Center at Mount Sinai Medical Center, Miami Beach, FL.